This post is sponsored by Bob’s Red Mill. As always, all opinions are my own. Thanks for supporting the brands that keep Lively Table running! Have you ever had hummingbird cake? 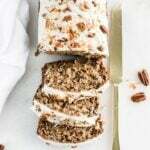 It’s a delicious cake with southern roots, made with bananas, pineapple and coconut, usually topped with cream cheese frosting. It’s absolutely delightful, but it is a somewhat heavy dessert. I decided to turn this classic southern dessert into a lighter version that’s breakfast and brunch appropriate, and totally approachable for everyday. I absolutely love a good banana bread, so I thought a banana bread-turned-hummingbird cake would be a lovely recipe for Easter. It’s springy and sweet, yet wholesome and light enough to enjoy with coffee for a quick pre-church breakfast or to grace your Easter brunch table. 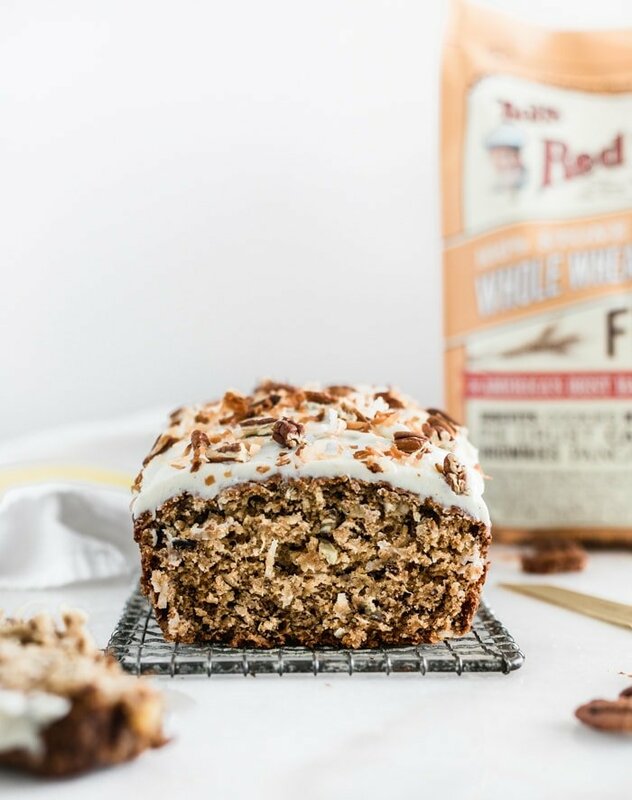 The key to this texture of this healthier hummingbird cake banana bread is Bob’s Red Mill Whole Wheat Pastry Flour. The fine whole wheat flour lends more nutrition and a lightly nutty taste without the super dense final product that traditional whole wheat flour usually results in. 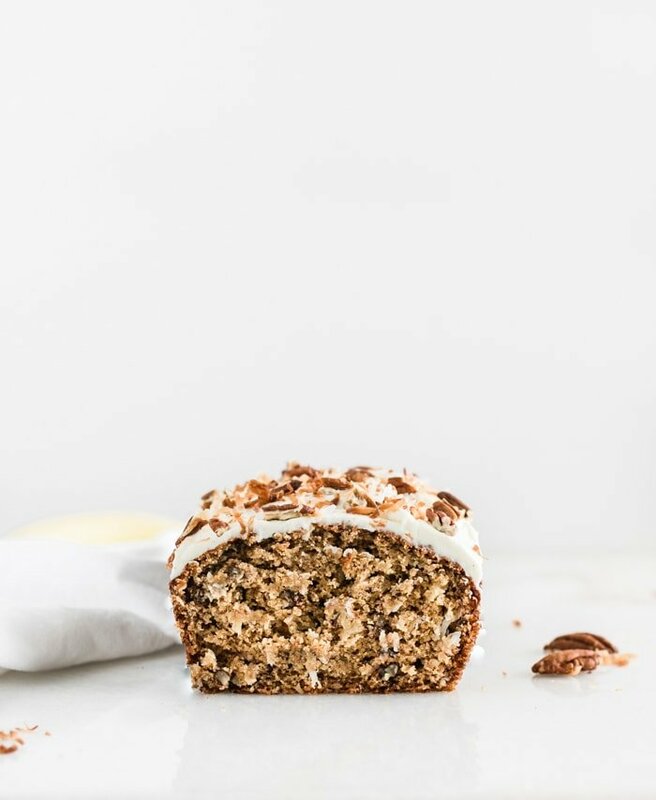 Don’t get me wrong, this hummingbird cake banana bread is still dense. 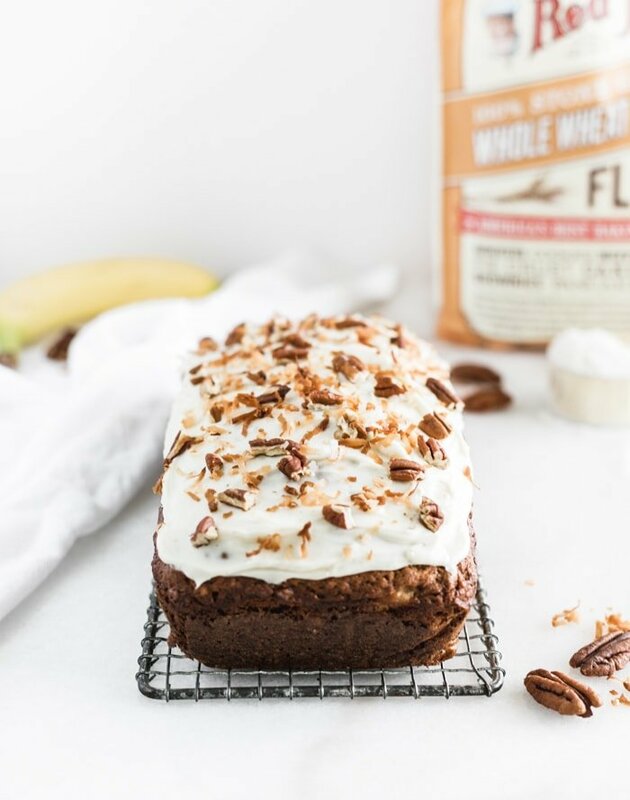 It’s filled with all kinds of goodies – bananas, coconut, pineapple, pecans – but in the best, moisture-retaining kind of way. Not the flat, crumbly, super condensed bread you’d expect from whole wheat flour. 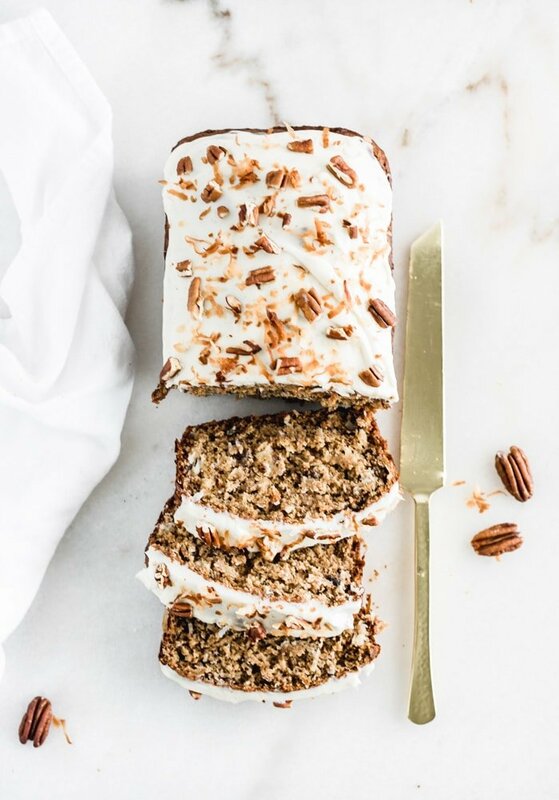 One of my favorite parts of this hummingbird cake banana bread? The cream cheese frosting. If you want your bread to be the absolute best, don’t skip the frosting. It’s rich and buttery and not too sweet. It’s the perfect topping to accompany the spiced coconut-banana-pineapple combo. All topped with toasted coconut and pecans for a little something extra. 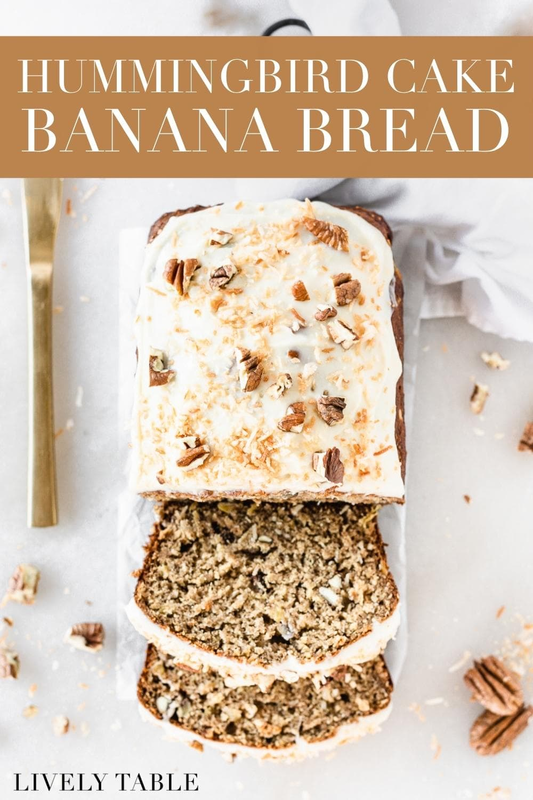 The bread itself is naturally dairy-free, but if you’d like a dairy-free version with the frosting, just swap in your favorite vegan cream cheese spread and use coconut oil or a dairy-free butter spread in place of the butter. 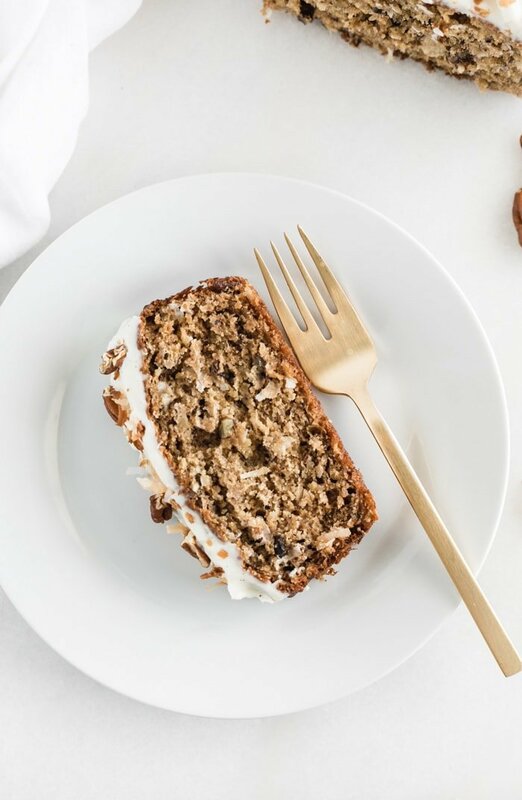 Make this delicious hummingbird cake banana bread for your Easter brunch, and watch as guests’ faces light up in delight! Or, you know, you could ‘forget’ to bring it, and enjoy it yourself all week long… I won’t tell! Heat oven to 350°F. Lightly grease a 9×5″ loaf pan or line with parchment. In a large bowl, whisk pastry flour, baking soda, cinnamon, nutmeg and salt. In a separate bowl, mash bananas well. Add sugar, coconut oil, eggs, vanilla and pineapple. Whisk until well combined. Pour wet mixture into dry mixture. Gently stir until combined, careful not to over mix. Gently fold in pecans and coconut. Pour into prepared pan. Bake 50-60 minutes, or until a toothpick inserted into the center of the bread comes out clean. Remove from oven and cool 10 minutes before removing loaf from the pan. Place on a cooling rack until completely cooled before frosting. To make the frosting, whisk butter, cream cheese, vanilla and powdered sugar until smooth. Spread onto cooled bread and sprinkle with toasted coconut and pecans. To toast coconut and pecans, spread in a single layer on a baking sheet, and toast in a 350°F oven for 5-10 minutes, watching carefully so they don’t burn. For dairy-free, swap cream cheese and butter in the frosting for your favorite vegan/non-dairy versions. This sounds perfect for Easter!! Yum!